A band of experts has spent a lot of time constructing a thoughtful report on possible reforms to the US law of copyright. The excellent Open Access News blog gives you the essential links. I have not read it all; it is a lot of reading — 150 dense pages. And it is all recommendations for the Copyright Office to consider before possibly asking Congress to change the law. But whoever was charged with finalising the report for publication did not think very carefully about how it would be read. Perhaps the publishers on the panel were not closely enough involved in the final stages. 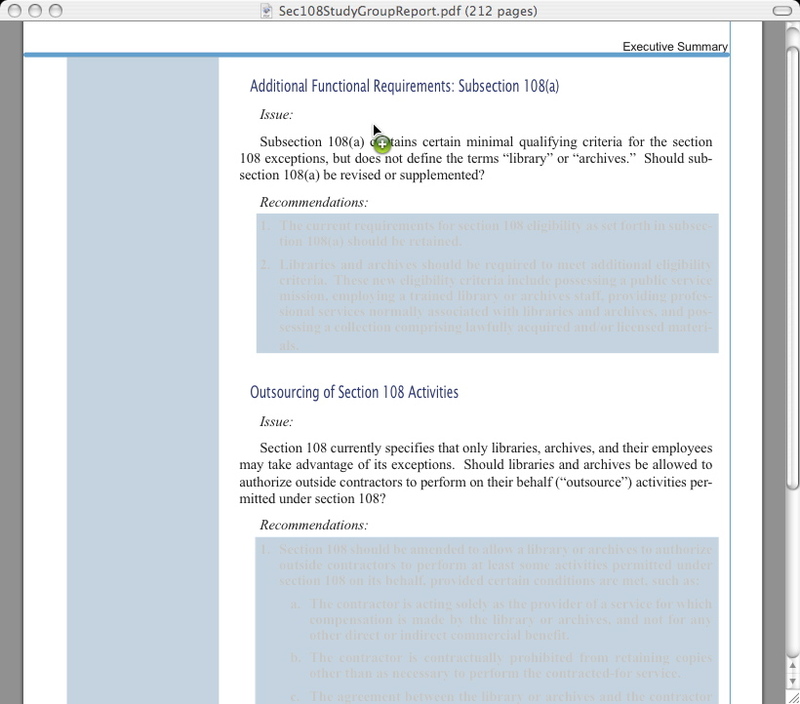 Under the normal default settings for Preview/PDF on my Mac, the light blue box in which the recommendations appear completely occludes the text. It is wearisome to have to cut and paste the text out of its blue boxes in order to read it. It would be mischievous to suggest that they did not want their recommendations to be read (so they put it with a blue background which disagrees with monitors and photocopying systems). The specific recommendation on this page will give scant encouragement to Google in its arguments with Publishers and others on the Library project. The recommendation rather explicitly disowns the Google Book Search modus operandi and the Google grab of copies which have not been explicity sought from rights holders. Here is the text of the invisible recommendation that will be disagreeable to Google — all three sub clauses are each enough to give GBS some heartburn. other direct or indirect commercial benefit. other than as necessary to perform the contracted-for service. If this is the way copyright experts are thinking, it would seem to be very clear that Google needs to find a way of backing out of its aggressive stance on rights in library copies.